Accessories: Cent Plis de Miao 90 Carré, BdP Bolide, MT pearls and turquoise ClicClac bracelet. I love this look Mai Tai! The blue is so summery with the pearls and shell. Very, very pretty! I'm going to copy it tomorrow for work. Someone once said: l'élégance, c'est la grâce. I am torn between telling you how much I love the look, and how flattered and touched that I am mentioned here. You know how much I adore les Cent Plis, especially on you, and in this particular capsule you are even more radiant than usual. 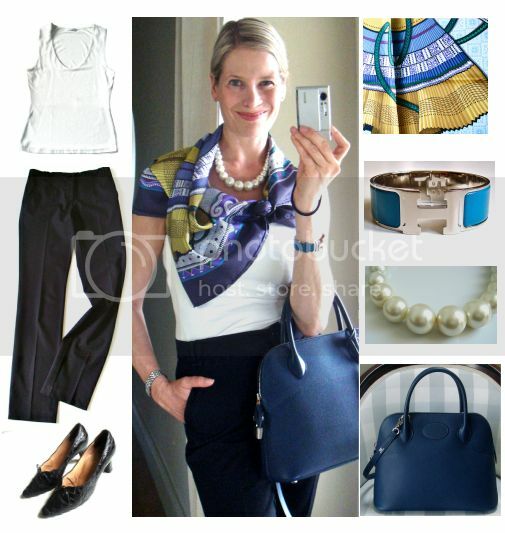 The MT pearls, the turquoise clic clac, paired with Ms BdP Bolide, the perfect black trousers, croc pumps and creme tank top all work perfectly to frame your beautiful smile, your poise and wonderful gesture. Classic and elegant as always, Mai Tai! I particularly like the cut and fit of your trousers (I notice this in a few of your posts) and lament how difficult it is in Australia to find trousers that are tailored to sit just under the waist rather than under or at the hip (which seems to be favoured here). Sublime.... love the entire look, especially the way you tied the les Cent Plis. Inspiring as always MT. So happy you liked the post, ma chère MonSacHermes, I loved doing a special pic for you. There will be more to come, I am truly smitten with the CPDM. It has become too hot to wear it around the neck for now, but will think of another way to wear it ...soon! Dearest Maitai, How extraordinarily beautiful! The splendid scarf framed by your gorgeous pearls and the creme tank, your exquisite blue beauties, the sunlight gently illuminating you and your smile - I'm totally speechless. And those shoes - just delectable! A heartfelt thank you for your very sweet and generous words, dearest MaiTai. And thank you for passing on the mousseline washing tips - but like you, I'm also scared to try my hand at it. Thank you for posting the H scarf story book - aren't they delightful! The Cent Plis is just lovely on you! This also reminds me that I could tie my scarves asymmetrically - I'm always in such a hurry and forget! this look definitely combines the parisian elegance whilst being a casual outfit that would be suitable for the office and evening.